The conservative focused on the word “indecency,” teaching that God required divorce for adultery. The liberal school focused on the word “some” (also translated as “any such indecency”), teaching that God required divorce for “anything” the man found to be indecent with his wife. 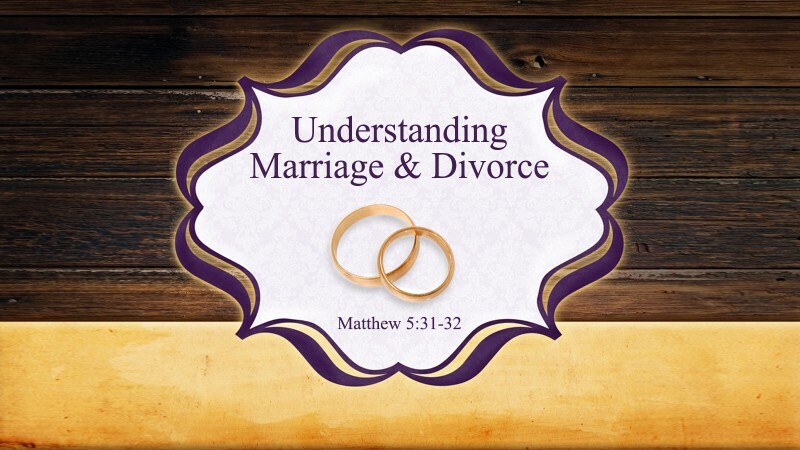 Jesus resets both of these inaccurate understandings of marriage and divorce. Jesus addresses this issue to a greater extent in Matthew 19, taking his audience back to Genesis, God’s original intent for the union of a man and woman. · Marriage is only between two people—one male and one female. · Marriage is two people made to be one flesh. · Marriage is meant to be permanent (hold fast). · Marriage is God purposefully joining a man and woman together. God brings two people together and unifies them to make the two to be one whole. One flesh is the mysterious union of two that can only be performed by God. As a minister officiating a wedding ceremony, I can pronounce a couple to be husband and wife, but only God can make the two become one. The theme of marriage is unity, therefore we should have nothing to do with the disunity of marriage. The intent of marriage is a demonstration of a greater lasting relationship (Christ and the Church). The key to marital unity and love is not romance but worship. Marriage is meant to express God’s glory. When speaking of a man and woman in marriage, Paul wrote: This mystery is profound, and I am saying that it refers to Christ and the church. (Ephesians 5:32 ESV) Marriage is God’s earliest expression of the union between Christ Jesus and the Church. Your marriage is a window into how Christ and his Church relate to one another, are one in union together and are purposed uniquely in a loving covenant relationship. To abuse marriage and to break the covenant of marriage is to tarnish the very image of Jesus’ loving relationship with his Church. We can understand why Satan is so determined to destroy marriage as God intended it. We can understand why he has sought to redefine it and tempts us so hard for covenants of marriage to be broken. He wants to deface and destroy the image of God’s love for people, Christ’s love for the church. The focus of marriage is God. Although marriage requires the actions of a man and woman, it is God who initiates the two coming together. The great I AM has sovereignly joined a man and woman together. Therefore, a man, a mere mortal, must not separate what God has joined together.